Round bins are a great way to use largely unused corner spaces in your business. 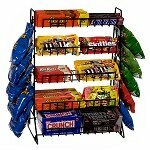 Place the 3-Tier Dump Bin with Sign Frame in high traffic areas and near the entrance and exits for an effective top-notch impulse display. 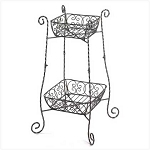 This wire floor fixture offers three shelves that measure 17-inches in diameter with heights of 6-inches and leaving plenty of space in between for water bottles and such. Customers can spot the 59-inch tall floor fixture from a distance and what is on exhibit inside by the sign on top and with three levels you are able to showcase lots of merchandise. 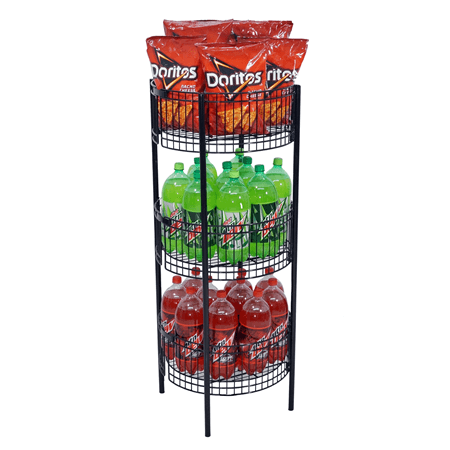 Take full advantage of this retail wire bin rack that can hold a number of 2-liter bottles of various types of soda, plentiful bags of chips, boxes of popcorn and more tasty and delicious snacks and merchandise. 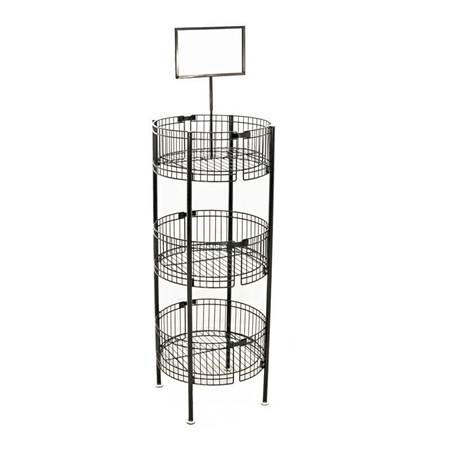 Order your round retail store display rack today!